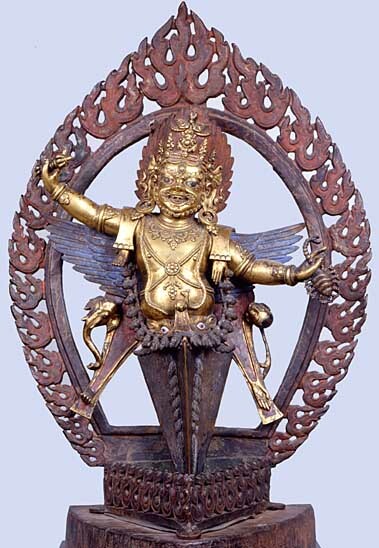 This figure of a fierce, winged deity is holding a vajra “thunderbolt-diamond” in his right hand and a scorpion in his left. The lower half of his body consists of the blade of a phur-bu, or kila “ritual dagger”, transfixing the bottom of a linga (effigy) on a triangular sacrificial area. The identification of the statuette is apparently uncertain and open to various interpretations. D. I. Lauf believes it to represent Gu-ru drag-mar in his particular manifestation as Padmasambhava. The work was cast using the lost wax technique before being gilded by the mercury amalgam process, given polychrome highlights, and then placed on a triangular wooden plinth. The commissioning or execution of a religious image was regarded as an act of great piety to be added to the list of deeds that would be judged and taken into account in future rebirths of the soul. Such pieces were made according to a strictly prescribed ritual, interspersed with prayers and various liturgical procedures. The divine image was then consecrated, enabling the god to be materialized in the eyes of the faithful and thus helping them in their acts of devotion. These figures became veritable religious media, facilitating the evocation of the deity during ceremonies or meditation sessions. They complied with the requirements stipulated in iconographical treatises and upon which depended the guarantee of their religious value. At present, this work cannot be categorized within a precise historical, regional or chronological context.